"Zumas gives socially awkward, mysteriously gifted and self-destructive outcasts spellbinding, unflinching voice in her debut collection. The heroes in this collection are trapped; some are resigned to years of caregiving, many are institutionalized and nearly all haunt the fringes of normalcy (or disregard the normal altogether). Each story begins with a lightning strike into a new consciousness: the first flashes of a romance over the lunch line in a psych ward in “Waste No Time if This Method Fails”; a teenager in the title story dreaming of abandoning his blind parents; the young woman of “The Everything Hater” living in sustained dread after her brother’s repeated suicide attempts. There are triumphs, too: a patient in treatment for an eating disorder exacts revenge on a bully, and an underage groupie liberates herself from her punk lover’s fabricated fairy tale world. Zumas captures halfway-house heartbreak as well as moments of thoughtful, scab-picking solitude. It’s a powerful, irresistible collection." A girl impetuously escapes the stagnation of her small-town life by running away with a rock star out of a dark fairytale, only to find herself caught in the new tedium of his narcissism. A son of independent but naïve blind parents, struggling to decide whether to leave home for college, discovers his mother hitting on his new best friend. A boy thinks he can save his sister from the clutches of an abusive boyfriend and a dead-end life when a witch comes to town promising an anti-love charm… but he finds she’s just a stray like him, an unfulfilled wife who flees the confines of her straight-edged life by indulging in gothic fantasy. A food-service employee in a mental hospital engages in a flirtation with an inmate. A young gay man in a half-way house loses everything to the schemes of a handsome conman. An older woman fantasizes about a young coworker by day and nurses ailing wild animals at night. From forgotten and hopeless places - places that are just ugly, not quaint, and full of that breed of bully born of boredom and small ponds - emerge FAREWELL NAVIGATOR’s (Open City Books, June 15, 2008) fragilely defiant protagonists. In the strange yet familiar American towns where many of these stories are set, adults are largely absent or incompetent, leaving a population of adolescents to try to sort things out for themselves, to find meaning without direction. Should they stay or go? Conform or resist? Whether they leave or not, they all struggle to hold on to their independence in the face of an overwhelming pressure to blur, to blend, to merely get by. Zumas’s characters - young and old alike - weave stories that will make their choices make sense. Without traditional anchors of religion, community, or family, they fight to find narratives that will imbue their lives with the significance they want desperately to achieve. As one character asks, “Is it from boredom? The need to build drama where there is actually very little?” In one voice, Zumas’s characters would answer with a quick but insecure, “No.” Her characters cling to the promise that there is much more than very little out there to be found, if only they knew where to look. Zumas seamlessly blends the fantastic and the mundane, sweeping the reader into world both surreal and ordinary. 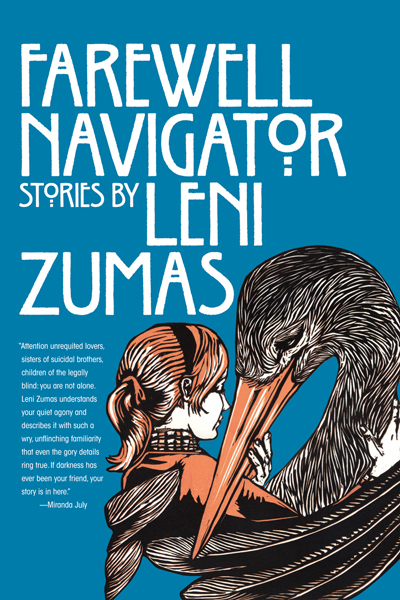 As FAREWELL NAVIGATOR proves, Zumas is a new voice in American fiction that deserves attention. She perfectly describes in engaging prose and keen dialogue both the cynicism and heavily guarded optimism that characterize this age. After traveling through America’s shadows and discovering not only desolation but also unexpected hope, readers will finish FAREWELL NAVIGATOR with that sense of pleasant disequilibrium that follows any great journey. Leni Zumas's fiction has recently appeared in Open City, Quarterly West, and New Orleans Review. She is a winner of the AWP Intro Journals Award for Short Fiction. A graduate of the University of Massachusetts–Amherst MFA program, she teaches writing at Hunter College and plays drums in the Brooklyn post-punk band S-S-S-Spectres. 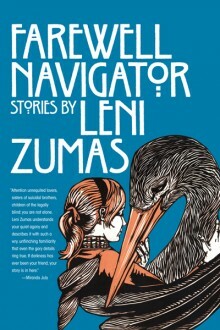 Leni Zumas will be available for interviews upon the release of the book. For more information on FAREWELL NAVIGATOR and/or to schedule an interview, please contact Adam Rifenberick, Press Box Publicity, via email at Adam@PressBoxPublicity.com or by calling 716.741.8495.